Bad practice in scrubbing and mopping floors can cause hazards like slips and trips that can lead to minor and major accidents. Generally, these circumstances occur when the flooring wasn’t properly mopped or scrubbed. And there’s a huge tendency that it was still wet due to liquid spills. To prevent you and your loved ones from getting injuries, this article will discuss some of the best methods of Perth floor cleaning that will absolutely suit the type of floor you have at home. As mentioned, there are different ways on how you will do Perth floor cleaning according to the materials you have. As we all know, there are a few cases of accidents that cause major injuries due to improper tidying methods. Some major accidents cost millions of dollars per year to cover all of the person’s treatment needs. Along with all the extreme damage to their lives and businesses. 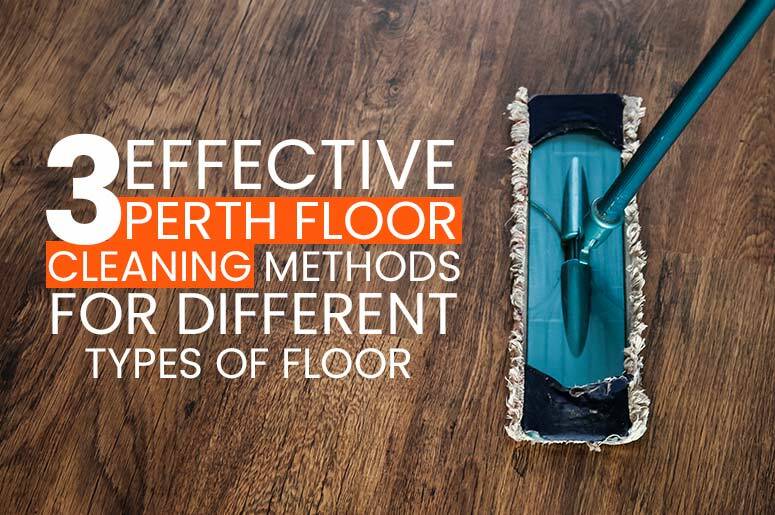 Good thing, there are proper Perth floor cleaning methods that you can try whatever type of flooring you prefer or have. For wood types, specifically those materials that are coated with polyurethane, it’s advisable to use a cloth when wiping it. You have to start first with removing the dust by sweeping or vacuuming it. Once done, re-apply polyurethane on it and leave it to get dry. If you’re planning to mop it with water and soap, stop. Because it may get buckled and leave a stain on the wood. Another tip, if you’re having trouble removing the stains on it, use a soft piece of cloth. Its softness will prevent it from leaving marks once you scrub the part where it has stains. You can use some of the old clothes that you no longer wear. When it comes to tile and stone materials, it’s also necessary to vacuum or sweep it to first. This may be your stairs, kitchen or bedroom. Check what kind of tiles you have. In that way, you’ll know what are the right chemical solutions for your Perth floor cleaning. Like for instance, for granite, travertine and marble types, the products you can use is for stone. While for ceramic and porcelain floors, an acidic tile solution is more appropriate. Once you’ve already identified, you can now wipe it with the right product after sweeping or vacuuming it. Use the wet mop when applying it and leave it dry. This type of flooring usually uses in commercial building or offices. The type of Perth floor cleaning uses a polymer coating to protect it from getting unnecessary marks and stains. Before you apply different products to it without any knowledge if that’s the right one for it, consult the professionals. A well-maintained floor can reduce the risk of injuries you’ll encounter. Your premise should be a safe place to live and stay in to. There are lots of ways you can find to make it happen. And with the above Perth floor cleaning methods we have discussed are just some of the great alternatives that you can try. Know more about how to take good care of your place! Maid in Perth has the best team of cleaners who can help you out! To get more details, feel free to visit our page. You can also check out our blog section for more helpful articles, tips and hacks. Call us today for more assistance. This entry was posted in Home Cleaning and tagged cleaning, floor cleaning, perth cleaning, perth floor cleaning.